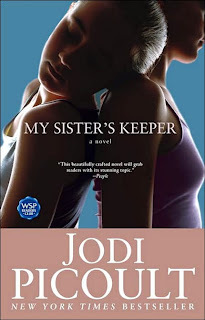 I have read quite a few books - but the most unforgettable read I have ever had is a novel by Jodie Picoult called My Sister's Keeper. I am not kidding you guys... if you are looking for a good summer read - THIS IS IT! Not only is the author the most phenominal writer I have ever come across, the story is flat out incredible. Honestly. She uses everything I learned in English - she is a proper writer - and her phrasing is gripping. You won't put it down... you will laugh - and you will cry (or at least I did). There is a movie coming out in a few months, but I am hesitant to see it because the book was just that good. I give it 5 stars! Do you have any other summer reading suggestions? I'm not sure anything could top this book - but lets give it a shot! Thanks for the tip :) I love finding out about good reads. I just got done with Jackie Collins "Lovers & Players". Ohhh it's a juicy must read. It jumbles around alot, but once you get past the first few chapters it's addicting. I couldn't put it down. I really like Eat Pray Love, The Kite Runner and The Time Traveler's Wife. I'll have to give MSK a read though, I think the movie looks good but was hesitant to pick up the book thinking it might be corny, but if you say it's good, it's worth a shot. Oh, I absolutely LOVED this book too, it was the first one of hers that I read and it's definitely the best. I would say it's one of my best ever books too - love that you love it too! I was excited to hear that there was a movie but they have changed stuff in the movie ie,the ending....which makes me think I will not see it. Other good books I have read recently "One Thousand Splendid Suns" and "The Kite Runner". PS It made cry too.....and while I cry all the time at the movies and TV, only 2 books have ever made me cry I think! I just discovered your blog - it's great! A great read this Summer is "Chasing Harry Winston" by Lauren Weisberger. p.s. OMG! I just noticed your Wedding Shoes - the Louboutins, Solely Beautiful!!! I just read this book, and two of her others, The Pact and Keeping Faith. Both were just as good as My Sister's Keeper. Love it! I brought this book back to SLO with me at the beginning of the quarter and haven't gotten a chance to read it yet... now I can't wait! so i read that the movie changed the ending? I never read the book but my mom did..and when we saw the preview I was weeping. I tend to weep in books: My Friend Leonard, Marley and Me, and THe Last Lecture have all been books iread on airplanes, and have had people ask me if i'm ok i just am a fountain! I am going to go to the library and get Julie and Julia i think!